Looks like Dr. Fronkenbrick is a tat disappointed. But you probably know what they say; it’s not the mistakes we make, it’s how we correct them that defines us. So let’s see how Dr. Fronkenbrick deals with his perceived mistake. These happen when we are doing something that is beyond our ability. These are ‘good’ mistakes. These mistakes tell us we are expanding our knowledge and going beyond our comfort zone. I make these mistakes all the time in professional life and in personal life (trying new Lego building techniques for example 😉 ) and don’t worry about these all that much. These mistakes happen when we achieve what we set out to do, but it turns out trying to achieve it in the first place was wrong (because we missed some kind of information for example). The ‘aha-moment’ comes when we learn this crucial piece of information making us realize our mistake. Well… these speak for themselves and in my personal life I make lots of them… my wife can tell you all about the mistakes I make in this category, lol. These are the mistakes we don’t want to make because we feel them to be disasters! These are the ones to avoid. I made these in my personal life and suffered the consequences… In my professional life there is no real room for these mistakes (I work in a hospital) and I managed to avoid them. I believe the mistake of Dr. Fronkenbrick to fall within this category. And if I’m wrong he himself certainly feels his mistake to be a disaster! How do you feel about mistakes? Ah, a thinking comic with that little bit extra for the reader to focus on and contemplate. I didn’t know about the different types of mistakes graph, so I’ve learned something today. Thank you. Being human we are prone to making mistakes. And boy has the Human Race made some whoppers over the centuries, but at the same time if we hadn’t made them, we might not have achieved the things that have made future generations lives better. Just think if experience was handed down from generation to generation by thought. That is, in being born knowing the mistakes. Would we still be making the same mistakes or just making less of them? I think I’m rambling now, so I’ll just say good start to your comic. I like the different expressions on the mini-figure head of the scientist. How was that done? Though this is not meant to be a thinking comic, I like it when this comic gets me thinking. I’ll put the thoughts I get fabricating the episodes up from time to time. This time my thoughts became questions on the nature of mistakes so I looked up some info on it. I didn’t know this either and thought I’d share it with you all. Good thoughts/ ‘ramblings’ on humanity and mistakes. What I did to get the different expressions is to turn the head around (I don’t shop expressions, this is a double-sided Lego-head) :). I think you should put a bigger picture on display, so readers can enjoy the art more. For the first comic, full colored, size was OK as the colors where enough to see all the details. I’d say it’s not as easy to enjoy the art in black/white as the pics look kinda “smaller”. Just a feeling though. Maybe because of the 1st panel… Or maybe I just need to get used to black/white LOL. You already got me into the story anyway… in 3 episodes LOL! I guess I’ll have a fun 2 years reading your newest comic! I’ve always been struggling with finding the right size for photo’s and comics. For now I’ll try this size. The panels itself have increased in size btw! I myself don’t experience the black and white panels to feel smaller, but then again; I know each panel in detail already 🙂 Also don’t worry, the comic will returning to full color relatively soon. The fact that you’re already into the story, three episodes in, feels like a really big compliment to me btw, Thanks! 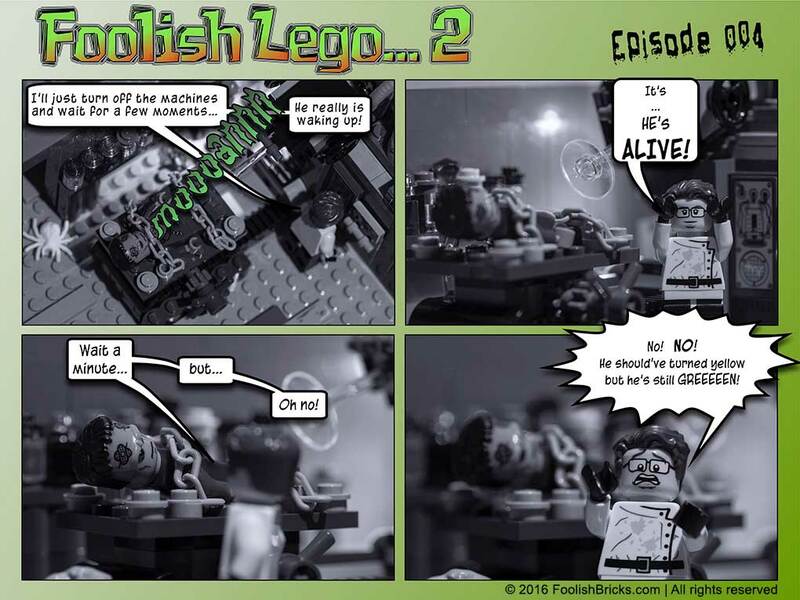 I think you have no idea how excited I’m about this comic… Long live Foolish Lego! I forgot to ask, how did you create the ‘rain’ in episode one? It looks very effective. I’ve been struggling with trying to find an effective way of showing falling rain. Could I use it in my comic, The Guard? Thank you. Looking forward to the rest of this serial. Create a new layer and fill it with black. Then I use the Add Noise-filter, at about 400% (uniform, monochromatic). Then the Motion Blur-filter for a “slanted motion blur”. Then add contrast to this layer in the “Curves adjustment panel”. Finally, switch the layer to ‘Screen’. Repeat this process a couple of times with varying size of grain and angle of motion blur.